BMW’s first ever drop-top M Performance vehicle has arrived on Australia’s shores with the launch of the all-new BMW M235i Convertible. 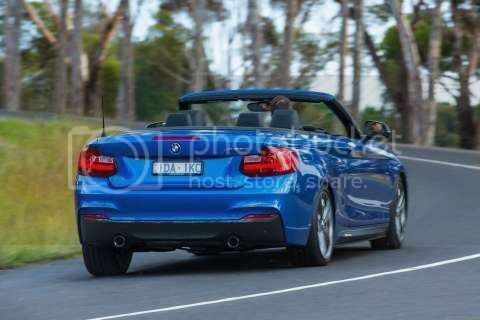 Priced from $85,800 plus on-road costs, the flagship model of the BMW 2 Series Convertible range bolsters a product portfolio which has undergone considerable rejuvenation over the past 12 months. Powered by a 3.0 litre, six-cylinder engine, the all-new BMW M235i Convertible delivers a 0-100km/h acceleration figure of 5.0 seconds. Generating 240kW and 450Nm of torque, the all-new BMW M235i Convertible also benefits from impressive engine elasticity which allows the car to sprint from 80km/h to 120km/h in just 5.6 seconds. BMW Group Head of Product and Market Planning Shawn Ticehurst welcomed the arrival of the highly-anticipated model down under. The BMW M235i Convertible is equipped with Adaptive M Suspension as standard and also armed with four-piston aluminium fixed calliper and two-piston rear calliper M Sport brakes. Variable sport steering with Servotronic speed assistance is joined by 18-inch light alloy wheels, Rear View Camera, front and rear Park Distance Control, Bi-Xenon headlights, BMW ConnectedDrive, heated seats for driver and front passenger, leather upholstery, HiFi loudspeaker system and Professional Navigation among inclusions in base form. The BMW M235i Convertible features a fully automatic electric folding soft top roof which is functional up to 50km/h, additional insulation cutting interior noise by 5 dB(A) in the front seats and 7 dB(A) in the rear. The M Performance TwinPower Turbo technology comprises a twin-scroll turbocharging system, High Precision Direct Injection featuring centrally positioned multi-hole injectors, VALVETRONIC variable valve timing and Double-VANOS variable camshaft timing. A cooling system, engine management and engine sound tuning, all of which have been exclusively customised to the requirements of the BMW 2 Series M Performance models, complete the picture. Engine performance and driveability is matched through custom-configured suspension and damping systems, as well as special front-axle elastokinematics, adapted as much to the characteristics of the engine, as it is to the body shape of the vehicle. Distinguishing itself from its fellow 2 Series Convertible siblings, the BMW M235i Convertible is immediately identifiable with its M-style front apron, large air intakes, and aerodynamically shaped body parts. The all-new BMW M235i Convertible is now available in BMW dealerships nationally. 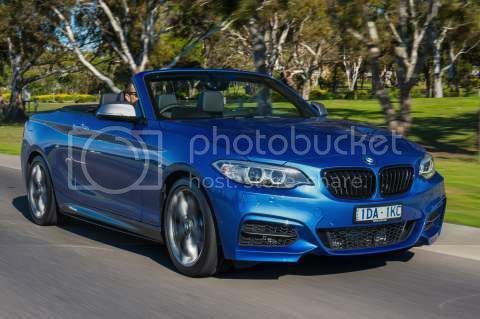 All maintenance requirements for the new BMW 2 Series Convertible range will be controlled by BMW’s Condition Based Service (CBS) program, which identifies the condition of a vehicle based on actual use, ensuring each BMW is always in first rate running order, and at the same time, minimising costs. Under the CBS system, sensors and advanced algorithms monitor and calculate the conditions in which the vehicle is used including mileage, time elapsed since the last service, fuel consumption and how the vehicle is driven. The information captured is used to determine the vehicle’s maintenance requirements, identifying that either an annual vehicle inspection or an oil service is due. BMW ConnectedDrive TeleServices automatically transmits this data to the customer’s preferred authorised BMW servicing dealer. This information is used by the dealership to pre-determine any maintenance or repair work required so the appropriate arrangements can be made. In addition, BMW service and selected maintenance costs can now be covered by a single, one-off advance payment with BMW Service Inclusive (BSI). BSI offers two packages: BMW Service Inclusive Basic provides scheduled servicing cover, while BMW Service Inclusive Plus combines scheduled servicing and selected maintenance items. Based on individual lifestyle needs, a year range and kilometre option is selected, starting from three years/60,000kms. The BSI plan provides a long-term solution enabling cover to be extended and transferred to future vehicle owners before expiry.